Built around the 7010 Series Triple Quadrupole GC/MS, the Dioxins Food and Feed Analyzer provides the sensitivity required for trace dioxin and dioxin-like PCB detection. With up to ten times more sensitivity than competitive triple quadrupole GC/MS analyzers, it allows you to observe below EU regulated levels of dioxins for ultimate confidence in your results. The Dioxins analyzer reduces method development time allowing your analysts to focus on calibration, validation and the analysis of real world samples. For more information on testing dioxins in food, visit the Dioxins & Dioxin-Like Compounds page. Factory Tested Reliability - The analyzer is setup and tested with factory-run checkout methods using a custom Dioxin Analyzer checkout mix. Compliant with new European Union Commission Regulations No 589/2014 and No 709/2014 which allows GC/MS/MS use as a confirmatory method for Dioxin analysis in Animal Feed and Foodstuffs. Customized Reporting combines results from Dioxin and Dioxin-like PCB fractions and automatically performs complex calculations required by the EU regulations. MassHunter Workstation Software delivers complete control from tune to report generation while streamlining your workflow. Heated Gold Quadrupoles, Triple-Axis HED-EM Detector and Fast Venting enhance mass spec performance by reducing common contaminants, neutral noise and cool down time. Integrated GC/MS system features and Early Maintenance Feedback (EMF) align and monitor GC/MS operation to maximize uptime and aid with planned maintenance. 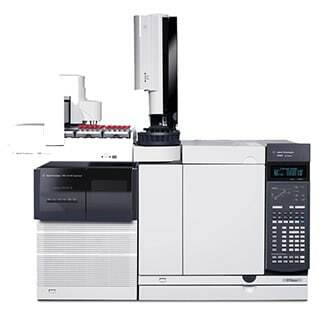 The Agilent 7890B GC offers high performance chromatography with a complete array of performance enhancing, time saving, and resource conservation features.